Videos and solutions to help Grade 5 students learn how to round a given decimal to any place using place value understanding and the vertical number line. 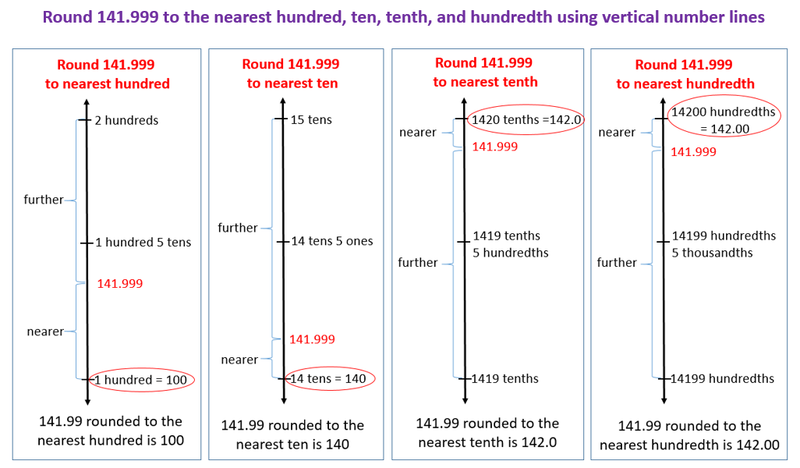 The following figure shows how to round 141.999 to the nearest hundred, ten, tenth, and hundredth using the vertical number line. Scroll down the page for more examples and solutions. Problem 1: Round 49.67 to the nearest ten. Problem 2: Decompose 9.949 and round to the nearest tenth and hundredth. Show your work on a number line. Problem 3: A decimal number has 1 digit to the right of the decimal point. If we round this number to the nearest whole number, the result is 27. What are the maximum and minimum possible values of these two numbers? Use a number line to show your reasoning. Include the midpoint on the number line. 1. Round the quantity to the given place value. Draw number lines to explain your thinking. Circle the rounded value on the number line. b. 382.993 to nearest hundredth. 3. A decimal number has two digits to the right of its decimal point. If we round it to the nearest tenth, the result is 18.6.
a. What is the maximum possible value of this decimal? Use words and the number line to explain your reasoning. 2. A trip from New York City to Seattle is 2,852.1 miles. A family wants to make the drive in 10 days, driving the same number of miles each day. About how many miles will they drive each day? Round you answer to the nearest tenth of a mile.